This portrait of Gustavo, a long-haired Chihuahua from Colorado, is by Baba. Big and bold with its bright blue background, this is a fun one. 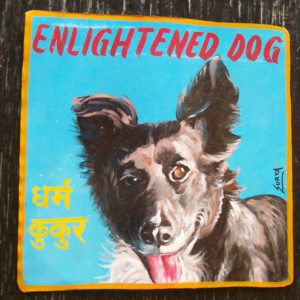 Gustavo the long-haired Chihuahua by Dilip is an enlightened dog, indeed. 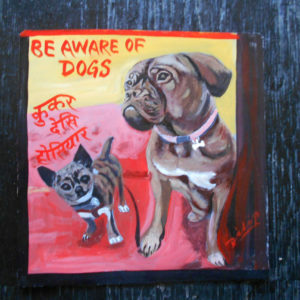 Ellis the Chihuahua and his Dogue de Bordeaux friend, Daisy by Dilip Niroj make a cute but odd couple in their portrait by Dilip Niroj. 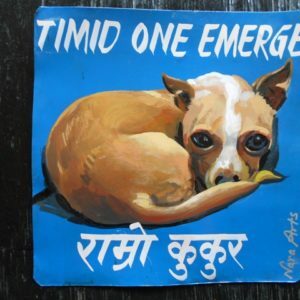 This portrait of an old chihuahua is by Hari Timesina. 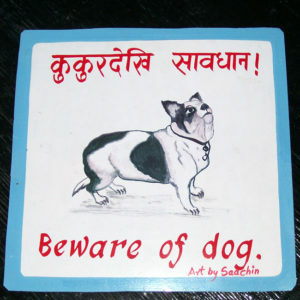 Hari is known for his outsider style and this is a fine example of that. Both artists gave particular care to the hands and collar in their portraits. 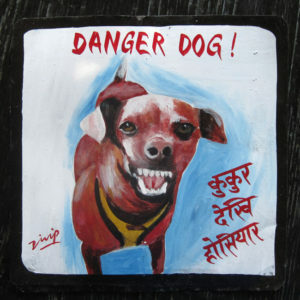 Megh Raj Thapa hand painted Icky the White Chihuahua on metal. This is a beautifully detailed portrait. Cha Cha the Chihuahua by Saachin. ChaCha is a feisty girl with heart-shaped markings on her side. 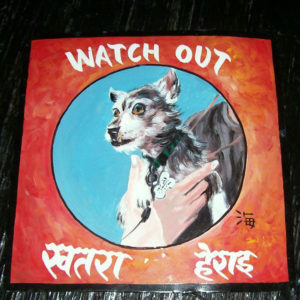 Sagar painted this toothy Chihuahua with his circle of fire, paying close attention to the human hands and the dog's collar. 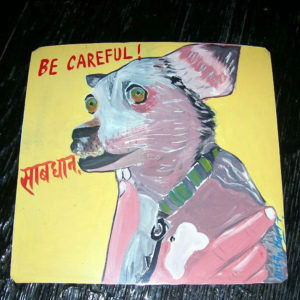 This beautiful White Chihuahua was hand painted on metal by Sanjib. 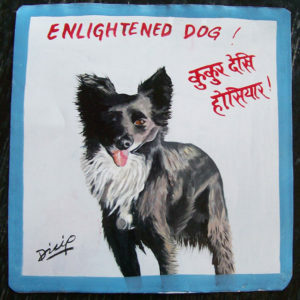 Sanjib is the only artist in the Nepal Art Dog project to use acrylic paint and thus this one cannot go outdoors. 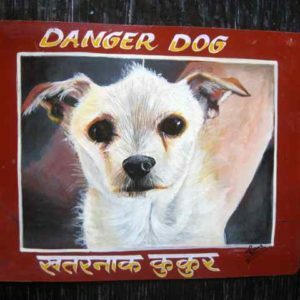 ChaCha the Chihuahua is a "Dangers Dog" in her portrait by Shree Laimachhaine. 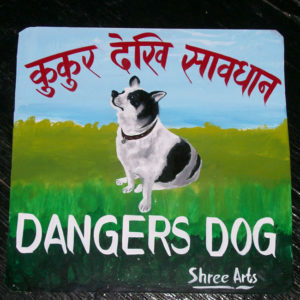 Shree is known for painting dogs on a verdant background. 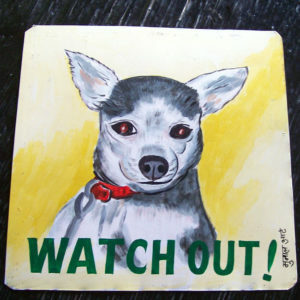 Folk art portrait of a Chihuahua hand painted on metal. 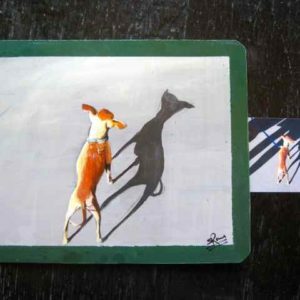 The artist Sanjib Rana uses acrylic paint and this painting is 12″x15″. 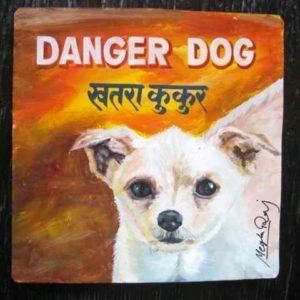 Russell the Chihuahua by Dilip Niroj seems to leap off the metal. 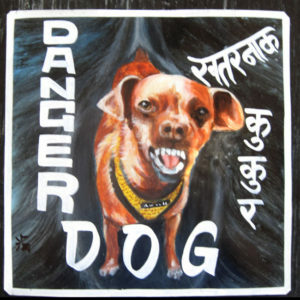 Want to keep burglars out stylishly? This is the one for you. 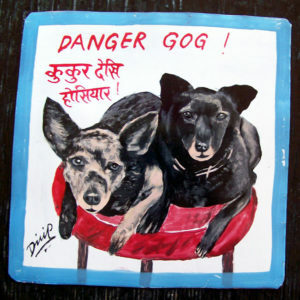 Ruby and Otterpop are cute as a pair of Chihuahuas in this Beware of Gog (sic) sign by Dilip Niroj. 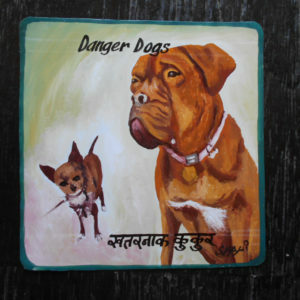 Daisy the Dogue de Bordeaux and her pal, Ellis the Chihuahua, are hand painted on metal by Shahi, a sign painter based in Pokhara, Nepal. I love the juxtaposition of the 2 very different sized breeds of dog(ue).